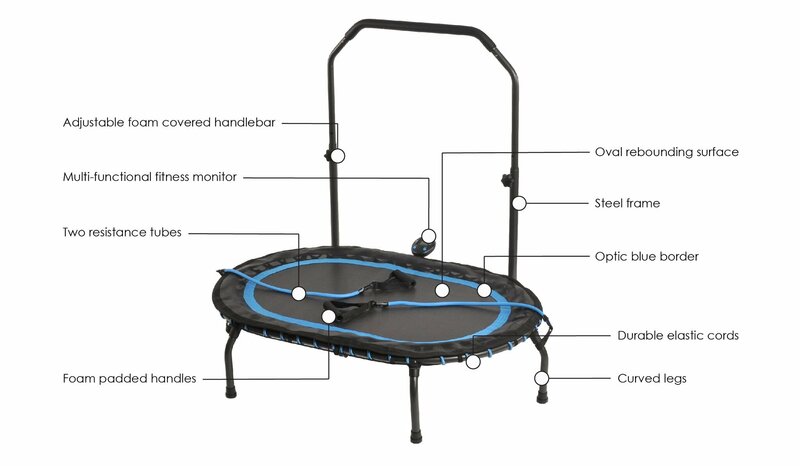 The Stamina InTone Oval Fitness Trampoline from RC Willey features a padded handlebar and electronic monitor for a fun way to work out. You will improve your cardiovascular fitness while you tone your calves, quads, hamstrings, and buttocks. This exercise equipment is inexpensive and just perfect for the best home gym. Strengthen and tone your upper body with the included resistance cords with paddle handles. Work your arms, shoulders, abs, back, and chest with a variety of fun and simple exercises. Includes a workout DVD! The padded handlebar adjusts to fit any height, adds stability, and puts you in control of your workout intensity. For a more intense workout, you can release the handlebar and add a little bounce, for less intensity use the handlebar to control your bounce. The electronic monitor times your workout, counts calories burned, and counts your number of jumps so that you stay motivated and reach your goals faster. Because it is affordable, compact, and fun, the Oval Fitness Trampoline workout is a great way to add variety to a boring or high-impact aerobic routine or to give you an ultra-effective aerobic workout.